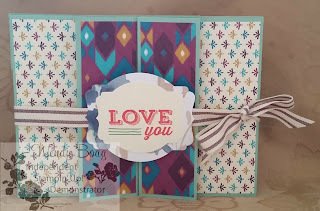 Welcome to the Crazy Crafters June blog hop. 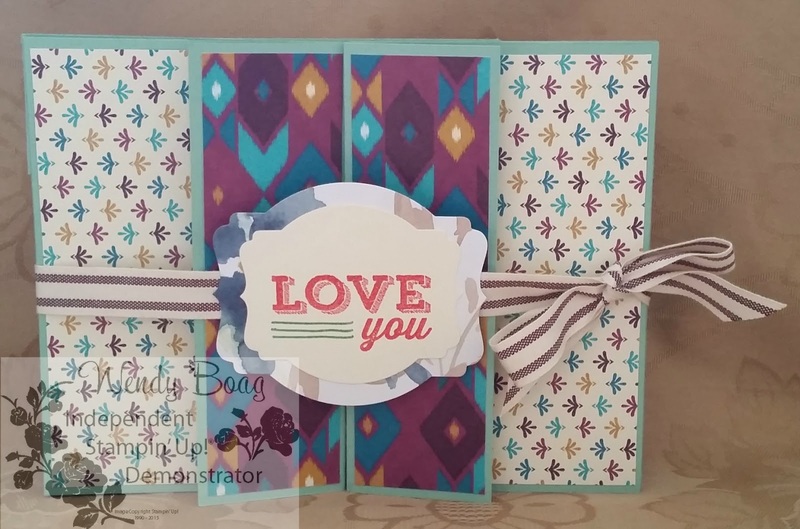 We are excited to show some of our favourite Stampin’ Up! products that were just released in our 2015 – 2016 Annual Catalog/Catalogue. We hope you find great inspiration from the projects. Get your wish list ready! You may just be starting the blog hop here at my blog - Wendy Boag or may have come from the person previous to me in the list below. If you get off track at any time, the full lineup below will help you move along from blog to blog so you see all the projects. At the moment you are visiting Wendy Boag. Thank you for taking part in our June blog hop, there are always alot of amazing ideas and inspiration from everyone who participates. Remember that currently you are at my blog - Wendy Boag, so check the blog hop line up list to see who is next in the list as you don't want to miss out on seeing one blog and the amazing inspiration. I had alot of fun doing this card. I enjoyed the varying difficulties that it had and then seeing the finished product. This is my first Blog hop and I hope you enjoy what I have done. This is what the card looks like when opened. Thanks for taking part in our blog hop, there are so many amazing ideas and inspiration you don't want to miss. Remember that currently you are at my blog - Wendy Boag, so check the blog hop line up list to see who is next in the list as you don't want to miss out on seeing one blog and the amazing inspiration. Thank you Vicki.I didn't like some of the pages on here, but now I like the whole pack. Well done Wendy! Great project and congratulations on your blog too! great cards Wendy and welcome to blogging. That mint macaron goes gorgeously with that paper! I'm definitely getting this!! Incredible!! You have spent lots of time on that. Wow. This is a really special gift for someone special; a real labour of love! Now that's a card!! Who wouldn't love getting this, they would feel very special for sure!! What a beautiful card! Gosh I love that DSP paper. Wow Wendy - lots of work in that card. Love how you showed the folded out view too. Great card. Now that's a card! Pefect balance of DSP and stamped images in your card design, just beautiful. You put so much work into your cards Wendy and it really pays off. Thanks for the inspiration! Thank you Fiona. I'm glad I'm able to be of some inspiration to you. Wow that is amazing. I love the use of the DSP. Thanks for sharing.